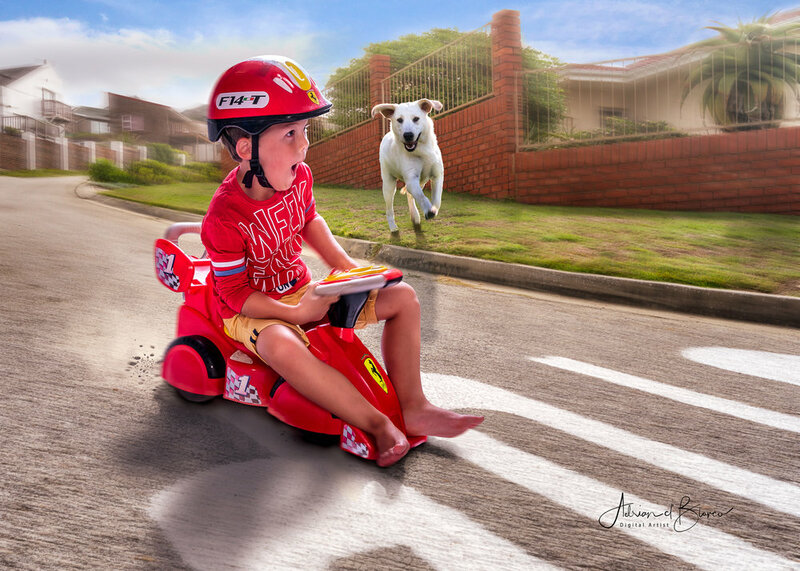 I am a passionate artist with camera and photoshop, the tools in the process of creating lasting moments. I am fairly laid back and easy to work with and you will find the results to be more artistic and slightly out of the box compared to normal family shoots and photos in general. My main focus will be fine art portraits and composite shoots where photography form the base to something a little more special and unique. If you are new to my work and site, take your time to get a better idea of what I do and provide. I am so happy you are visiting! Let's take a moment and get still. Let's create a timeless image to be displayed on your wall. Taking photos further to a digital painting. I love doing realistic or near realistic compositions through the use of multiple images to create one piece that in some cases look like it had been photographed like that. I love creating compositions that take photos into a whole new direction and producing a piece of art that can proudly hang in any home. I do like Landscape, Wildlife and Sport Action Photography when I get the chance. Every now and then I get a chance to shoot people while I can just observe and record a day as it happens. It is great fun and can be a source of inspirational moments and photos.